The Current paradigm of Galactic Cosmic Rays is based on the belief that Supernova Remnants - the results of gigantic explosions manifesting the death of massive stars - are responsible for relativistic protons and nuclei up to energies at last 10^15 eV (=1PeV or Petaelectronvolt). Over many decades, this conviction has been supported by phenomenological arguments and theoretical meditations. One of the great achievements of gamma-ray astronomy of recent years was the discovery of gamma-rays from a large number of young and mid-age SNRs proving that these objects are indeed effective accelerators of protons and/or electrons. Motivated by the assumption that the entire energy range of galactic CRs, up to the “knee”, is contributed by a single source population, significant efforts have been made over recent years to find SNRs with a distinct signature of PeVatrons (machines which accelerate particles to PeV energies). However, gamma-ray spectra reported from more than a dozen young SNRs appeared to be quite steep which can be interpreted as a result of "early" cutoffs (<< 1 PeV) in the spectrum of parent protons. Moreover, the theoretical developments of recent years also revealed serious problems for accelerating particles to PeV energies. This has raised certain doubts inside the CR community regarding the ability of SNRs to operate as CR Pevatrons. Massive stars produced at the collapse of giant molecular clouds, form compact groups and remain tightly linked during their entire life. Acceleration of particles in these objects can be initiated by interacting winds directly in the vicinity of stars or in the so-called superbubbles driven by stellar winds and SN explosions (see Figure). The conditions in these objects can be more favorable for particle acceleration to PeV energies than in individual SNRs. This makes the clusters of massive young stars an attractive alternative to SNRs as CR factories contributing to the highest energy CRs around the “knee”. A schematic diagram which reveal the acceleration and radiation process of CRs near the young star clusters. We report on a compelling similarity of the energy and radial distributions of multi-TeV protons extracted from observations of gamma-ray from these extended structures surrounding three young star clusters (for detail see https://www.nature.com/articles/s41550-019-0724-0). The derived 1/r decrement of the CR density with the distance from a star cluster is a distinct signature of continuous, over a few million years, cosmic ray injection into the interstellar medium. 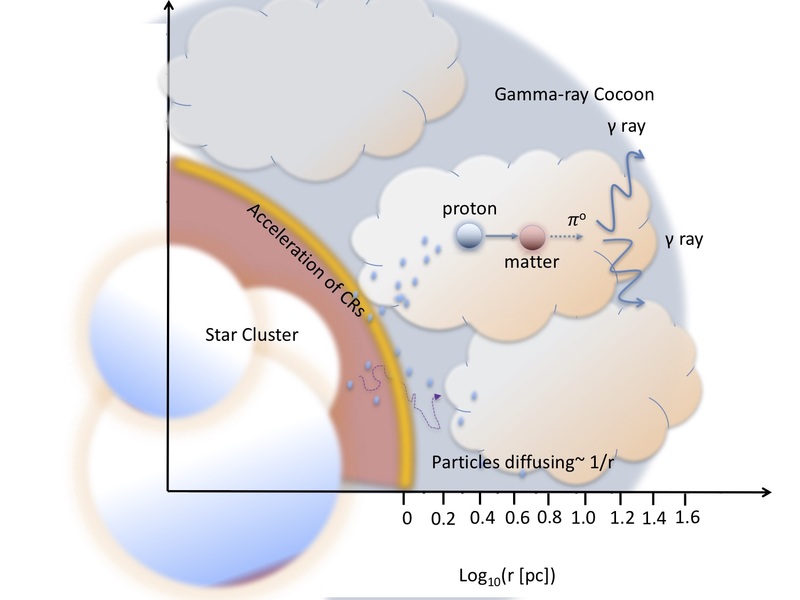 The hard (E^-2.3 type) energy spectra and the required high acceleration efficiency derived from gamma-ray data, point to clusters of young massive stars as promising PeVatron candidates and dominant contributors to the flux of highest energy cosmic rays in the Milky Way. This conclusion does not imply a dramatic revision of the current paradigm since at lower energies SNRs are likely to remain the major factories of galactic cosmic rays. The extension of spectrometric and morphological gamma-ray measurements up to 100 TeV in the energy spectrum and up to several hundred of parsecs regions surrounding compact clusters of massive stars can provide crucial information about the origin of galactic cosmic rays in general, and the physics of proton PeVatrons, in particular. Such observations with CTA (Cherenkov Telescope Array) will be available in the near future.